These pieces are created by mixing the paint directly upon the canvas. Many evoke a landscape feel given to the title of this series. Meditation is a precursor to the creation of each work, giving rise to the sacred spiral or the circular yellow sun as the initial element applied. The spiral or sun may be painted out in the process, but it is still integral to the piece, just as spirit remains intact through the shifting vistas of existence. Merging genres of Sumi painting and stained glass windows are the impetus for this series. 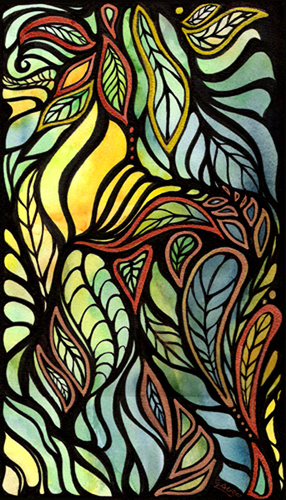 Intense colors flowing into one another are layered on top by black lines creating unity and form within each watercolor and ink piece. The use of repeated pattern and curvilinear emphasis is reminiscent of Art Nouveau and the intent is to honor that particular art style and take it into the realm of abstraction through self-expression. 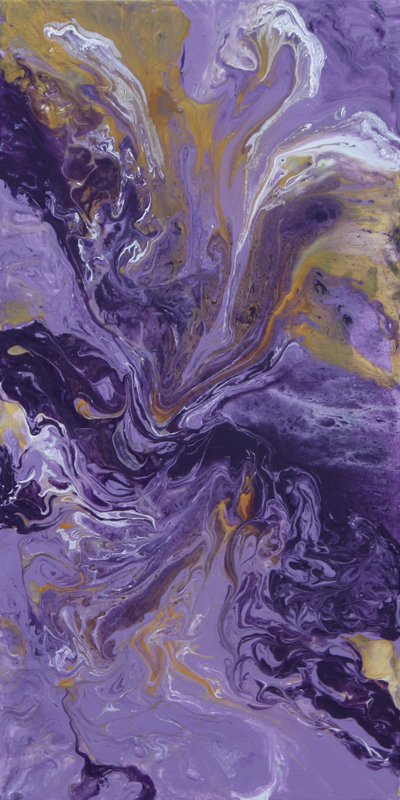 After studying Ebru and learning paper marbling, I wanted to be able to do something similar on canvas without actually dipping a large canvas into a swimming pool of water. Various techniques continue to evolve as I experiment with the elements in each succeeding piece. The name of this series came about because the painting is transformed by a process that takes place on the surface after the paint is applied onto the canvas and allowed to dry on its own. The finished piece has infinite complexities which are fascinating on their own as well as within the context of the larger painting. As the 20th Century architect, Mies van der Rohe eloquently stated, "God is in the details." This series incorporates the use of the written word, be it a poem, song or simply a random thought that comes to mind in the process of creating. Emotions are essential in many pieces, illustrating the highs and lows of the human experience. This is a series of plant images painted in vibrant colors. Colors not naturally inherent are used to express the organic force of the subject matter. 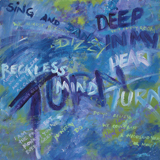 The painted strokes demonstrate the rhythmic flow of energy which permeates everything. Painted sculptural forms made from various modeling media on 2D surfaces are the focus of this series. The surface is built up in high or low relief fashion and then painted. Sometimes representational forms take shape, and sometimes the high reliefs are altered by carving into them. Working with reliefs arose from a long abiding fascination of aged textures such as copper patina, tree barks and weathered buildings. It highlights the impermanence of life and depicts the beauty of decay that is not always recognized or appreciated. 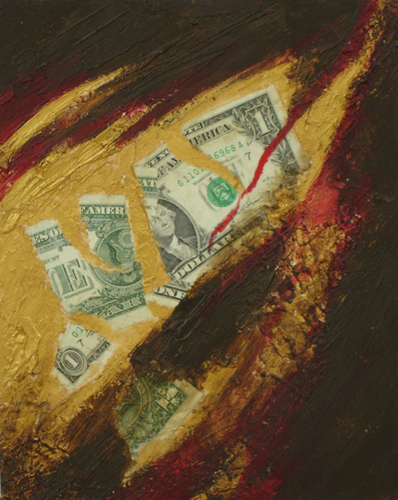 Commentary on relationships to money, especially the emotional impact upon people. The impetus of this collage series was a cathartic response to a personal issue. The theme explores how money can destroy marriages and tear families apart. 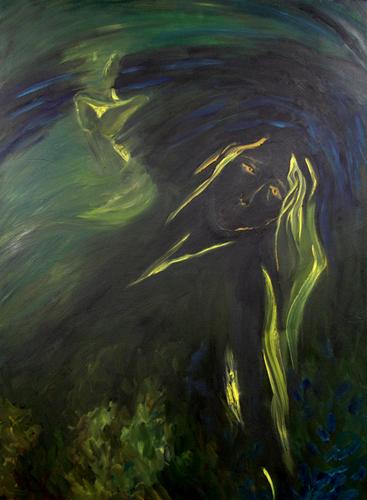 Paintings and drawings depicting the human figure. The subjects appear isolated in their world to suggest that ultimately we all have to make it through life by ourselves. Each is contemplative through its relative title. The series resulted through figure drawing workshops and the artist's inner struggles. 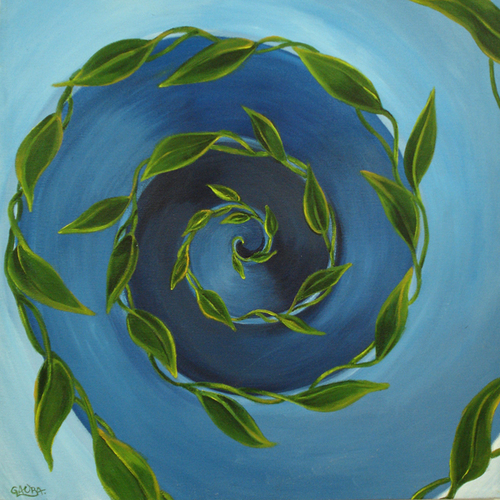 A spiritual awakening was the catalyst to paint spirals as it is an ancient symbol of growth and evolution. The spiral is a reoccurring theme permeating through the artist's work and this series treats it as subject matter for exploration.